Introduction: Acute heart failure (AHF) is a leading cause of hospitalization and readmission in the US. The present study evaluated maximum diuresis while minimizing electrolyte imbalances, hemodynamic instability, and kidney dysfunction, to achieve a euvolemic state safely in a shorter period of time. Methods and results: A protocol of combined therapy with furosemide, metolazone, and spironolactone, with or without tolvaptan and acetazolamide, was used in 17 hospitalized patients with AHF. The mean number of days on combination diuretic protocol was 3.8 days. The mean daily fluid balance was 3.0±2.1 L negative. The mean daily urine output (UOP) was 4.1±2.0 L (range 1.8–10.5 L). There were minimal fluctuations in serum electrolyte levels and serum creatinine over the duration of diuretic therapy. There was no statistically significant change in patients’ creatinine from immediately prior to therapy to the last day of therapy, with a mean increase in creatinine of 0.14 mg/dL (95% CI −0.03, +0.30, p=0.10). Conclusion: Our strategy of treating AHF by achieving high UOP, while maintaining stable electrolytes and creatinine in a short period to euvolemic state, is safe. 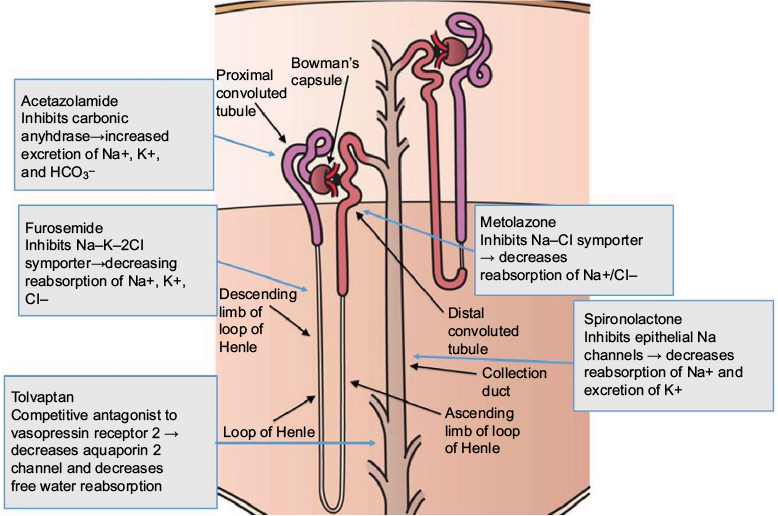 Figure 1 Schematic of sites of action and mechanism of ion channel blockade by selected diuretics in the nephron. The general theme of diuresis in AHF has been to relieve symptoms and achieve diuresis conservatively to a dischargeable state, which largely falls short of achieving a euvolemic state.10 We implemented a protocol of combined therapy with furosemide, metolazone, and spironolactone, with or without tolvaptan and acetazolamide, in an attempt to maximize diuresis while minimizing electrolyte imbalances, hemodynamic instability, and kidney dysfunction,17 with a goal to achieve a euvolemic state safely in a shorter period of time. Herein, we report our experience with this protocol in a retrospective series of patients with AHF and its impact on diuresis, kidney function, electrolyte balance, and hemodynamic stability. The project protocol was approved by the institutional review board of Stony Brook University. Data were de-identified and stored on the secured drive of Stony Brook University. We retrospectively evaluated 17 patients admitted with signs and symptoms of fluid overload related to AHF. This was clinically determined by the on-service attending physician using the Framingham criteria for heart failure (HF) and echocardiographic findings.18,19 These signs and symptoms included the documented presence of exertional dyspnea, orthopnea/paroxysmal nocturnal dyspnea, jugular venous distention, rales, lower extremity edema, nocturnal cough, tachycardia >120 bpm, and pleural effusion or pulmonary edema as seen on radiologic imaging. We collected data on consecutive patients who underwent a combination regimen of diuretics, including intravenous (IV) furosemide (bolus or infusion), metolazone, and spironolactone, with or without tolvaptan and acetazolamide. Each diuretic was started, while serum electrolytes were closely monitored throughout the day. IV furosemide, oral metolazone, and oral spironolactone were initiated first with a goal to achieve a target fluid loss of 4–5 L/day. Tolvaptan was added if serum Na was <135 mmol/L, and dose was titrated to maintain a serum sodium of 131–139 mmol/L (based on the initial value, maximum correction was 6–8 mmol/L, which did not exceed 139 mmol/L in 24 hours). Acetazolamide was given as a daily IV bolus if serum bicarbonate was >30mmol/L and to maintain serum bicarbonate 24–30 mmol/L (Table 1). Close monitoring of serum electrolytes was performed to ensure that safe levels of sodium and potassium were maintained. Serum electrolyte levels were measured every 6 hours over each day during combination diuretic treatment. Data on net fluid balance and mean arterial pressure (MAP), as well as serum N-terminal pro b-type natriuretic peptide (BNP), were trended. Data on cardiac structure and function were obtained from the most recent transthoracic echocardiogram. After initial diuresis to a clinically euvolemic state as determined by the cardiology and the nephrology attendings, the patients were maintained and discharged on an individualized oral diuretics regimen as determined by the primary team and cardiology and nephrology services. Notes: *Doses of furosemide and metolazone were titrated based on UOP. ^Spironolactone dose was titrated to maintain serum potassium of 4–4.5 mmol/L (mEq/L). #Tolvaptan dose was titrated to maintain a serum sodium of 131–139 mmol/L (mEq/L); based on the initial value, the maximum correction was 6–8 mmol/L (mEq/L) and not to exceed 139 mmol/L (mEq/L) in 24 hours. $Acetazolamide was used to maintain serum bicarbonate 24–30 mmol/L (mEq/L). Abbreviations: IV, intravenous; PO, by mouth; UOP, urine output. Descriptive statistics were performed. Categorical variables were presented as numbers and proportions, and continuous variables were presented as mean ± standard deviation (SD). Categorical values were assessed with chi-square test and continuous variables with Student’s t-test. Differences in pre- and posttreatment creatinine and hemoglobin/hematocrit were assessed using data from immediately prior to initiation and last day of intensive combined diuretic therapy. The SD of daily electrolyte levels was averaged for each patient over the course of their therapy, and the mean was obtained of all patients. Given the tendency of extreme values to skew means, a range was also obtained of the highest and lowest electrolyte values over the course of the entire diuretic regimen. Patients with HF with reduced ejection fraction (HFrEF) were defined as those with EF ≤50%, while patients were considered to have HF with a preserved EF (HFpEF) if they had EF ≥50%.20 All calculations were performed using SAS software, version 9.3 (SAS Institute Inc., Cary, NC, USA). Of the 17 patients, nine were male and eight were female, with a mean age of 69.0±15.4 years (range 38–93 years). Patients had a mix of comorbid conditions, including hypertension (n=15), coronary artery disease (n=10), and diabetes mellitus (n=8). The mean weight was 98.9±21.7 kg (range 70–141 kg). All patients had known chronic kidney disease, with a mean estimated glomerular filtration rate (eGFR) of 30.6±13.6 mL/min/1.73 m2 (range 8–59 mL/min/1.73 m2). Nine patients had HFrEF; the overall mean EF was 44.1±18.0% (range 20%–72%). There were no statistically significant differences in age, GFR, or duration of diuretic therapy between patients with HFpEF or HFrEF. Seven patients were managed in an intensive care unit, nine in a step-down unit, and one on the general medicine ward. One patient had a functioning renal allograft. No patients needed ultrafiltration. Two of the patients were on IV inotropes. The average pro-BNP levels on admission were 10457.2±11084.6 pg/mL (range 422–32494 pg/mL), n=12. Three of the patients (18%) were readmitted back to the hospital within 30 days of discharge. 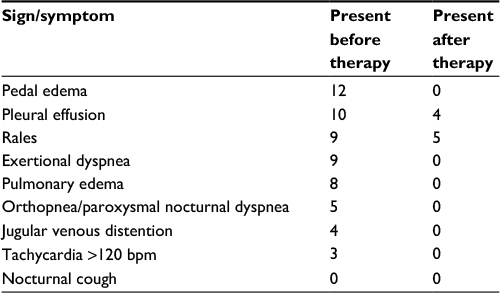 Patients had presented in a volume-overloaded state as defined previously, with the most common presenting symptom of exertional dyspnea (n=9) and the most common sign reported as pedal edema (n=12). The vast majority of patients showed a significant improvement in signs and symptoms of fluid overload at the completion of diuretic therapy (Table 2). The mean number of days on combination diuretic protocol was 3.8 (range 1–8 days). The mean daily fluid balance was 3.0±2.1 L negative. The mean daily urine output (UOP) was 4.1±2.0 L (range 1.8–10.5 L). The MAP did not fluctuate significantly, with an average MAP of 79.8±5.4 mmHg in each patient. When serial weights were recorded, the mean weight loss was 7.0 kg over the duration of diuretic therapy (n=9, range 1.0–14.2 kg). Average daily doses were furosemide 235±149 mg IV (mean dose of 2.7 mg IV/kg body weight), spironolactone 82±37 mg orally, and metolazone 8±4 mg orally. When used, acetazolamide (n=1) dose was 500 mg IV and tolvaptan (n=3) dose was 21±8 mg orally. There were minimal fluctuations in serum electrolyte levels and serum creatinine over the duration of diuretic therapy (Table 3). The changes in serum sodium, potassium, and eGFR in 24-hour intervals as well as the daily mean UOP are shown in Table 4. There was no statistically significant change in patients’ creatinine from immediately prior to therapy to the last day of therapy, with a mean increase in creatinine of 0.14 mg/dL (95% CI −0.03, +0.30, p=0.10). Eight out of 17 (47%) patients required potassium supplementation over the course of diuresis, with an average daily dose of 38.6±25.7 mEq (range 25–100 mEq). Individual patients’ data are shown in Table 5. Notes: *Mean of individual daily electrolyte concentrations averaged across all patients. ^SD of individual daily electrolyte fluctuations averaged across all patients. #The range of individual daily electrolyte fluctuations averaged across all patients. Note: *Statistically significant change from prior at p<0.05. Abbreviations: eGFR, estimated glomerular filtration rate; SD, standard deviation; UOP, urine output. Notes: #Mean daily dose of potassium supplementation over course of diuresis in mEq. ^Patient also received tolvaptan to maintain target sodium levels. *Patient also received acetazolamide to maintain target bicarbonate levels. Abbreviations: D, diabetes; H, hypertension; C, coronary artery disease; EF, ejection fraction; UOP, urine output; K, serum potassium; Na, serum sodium; HCO3, serum bicarbonate; Cr, serum creatinine; MAP, mean arterial pressure; Hgb, hemoglobin; F, female; M, male. We report a series of 17 patients with AHF due to severe volume overload who achieved clinical euvolemic status with a diuretic and aquaretic regimen including furosemide, metolazone, and spironolactone within a mean of 4 days. Acetazolamide and tolvaptan were used as needed. Renal function and serum electrolytes remained stable. Given the frequent readmissions and lengthy hospitalizations for AHF, this strategy accelerated restoration to a clinically euvolemic state. The current pattern of diuretic use in AHF suggests that patients are inadequately diuresed by the time of discharge. The 30-day all-cause readmission rate after AHF remains ~25% for Medicare patients.2 Although the factors contributing to this trend are multifactorial, one potential reason is that patients are not effectively treated before discharge.21 A combined analysis of the Diuretic Optimization Strategies Evaluation (DOSE) and the Cardiorenal Rescue Study in Acute Decompensated Heart Failure (CARRESS-HF) trials has demonstrated that more than one-third of the patients still had congestion when they were discharged from the index hospitalization.6 Our goal in this case series is to show that patients have effectively and safely achieved a euvolemic state in a short time interval. The mean duration of diuretic therapy was <4 days, and the mean daily UOP was >4 L, and this was achieved with relatively stable kidney function and hemodynamic and electrolyte parameters. There was only a non-significant trend toward increase in creatinine. Likewise, the changes in electrolytes occurred within generally accepted parameters. A high dose of spironolactone also helped maintain potassium levels within the target range in the setting of significant diuresis. We emphasize that while the combination diuretic therapy was successfully administered in settings ranging from intensive care units to general medicine wards, this was accomplished with the use of frequent serum blood testing and a close working relationship between the nephrology service and consulting teams. Our data are limited to in-hospital outcomes. The effect of our strategy on post-discharge outcomes requires a comparator group and longer term follow-up. Although based on the association of persistent congestion and outcomes, these data are encouraging for potentially improving outcomes in AHF patents. This protocol was used with close monitoring of electrolytes under the supervision of an experienced team of cardiologists and nephrologists. This case series demonstrates the potential of combination diuretic therapy for allowing diuresis of a large amount of fluid safely and within a short period of time. Ultimately, this may prevent prolonged hospital stay and frequent readmissions, and such a strategy needs to be evaluated in a randomized controlled trial. We extend our strategy in treating volume-overloaded AHF patients and achieving high UOP while maintaining stable electrolytes and creatinine in a short period to a euvolemic state. Further data on longer term outcomes are needed. McMurray JJ, Adamopoulos S, Anker SD, et al. ESC Guidelines for the diagnosis and treatment of acute and chronic heart failure 2012: The Task Force for the diagnosis and treatment of acute and chronic heart failure 2012 of the European Society of Cardiology. Developed in collaboration with the Heart Failure Association (HFA) of the ESC. Eur Heart J. 2012;33(14):1787–1847. Ross JS, Chen J, Lin Z, et al. Recent national trends in readmission rates after heart failure hospitalization. Circ Heart Fail. 2010;3(1):97–103. Nohria A, Tsang SW, Fang JC, et al. Clinical assessment identifies hemodynamic profiles that predict outcomes in patients admitted with heart failure. J Am Coll Cardiol. 2003;41(10):1797–1804. Gheorghiade M, Pang PS. Acute heart failure syndromes. J Am Coll Cardiol. 2009;53(7):557–573. Wadhwa NK. Cardiac Intensive Care. 2nd ed. Philadelphia, PA: Elsevier Health Sciences; 2010. Felker GM, Lee KL, Bull DA, et al. Diuretic strategies in patients with acute decompensated heart failure. N Engl J Med. 2011;364(9):797–805. Cleland JG, Coletta A, Witte K. Practical applications of intravenous diuretic therapy in decompensated heart failure. Am J Med. 2006;119(12 suppl 1):S26–S36. Jentzer JC, DeWald TA, Hernandez AF. Combination of loop diuretics with thiazide-type diuretics in heart failure. J Am Coll Cardiol. 2010;56(19):1527–1534. Bansal S, Lindenfeld J, Schrier RW. Sodium retention in heart failure and cirrhosis: Potential role of natriuretic doses of mineralocorticoid antagonist? Circ Heart Fail. 2009;2(4):370–376. Shakar SF, Lindenfeld J. Treatment approaches to congestion relief in acute decompensated HF: insights after DOSE-AHF and CARRESS-HF. Curr Treat Options Cardiovasc Med. 2014;16(8):330. Passantino A, Monitillo F, Iacoviello M, Scrutinio D. Predicting mortality in patients with acute heart failure: role of risk scores. World J Cardiol. 2015;7(12):902–911. Sica DA. Metolazone and its role in edema management. Congest Heart Fail. 2003;9(2):100–105. Muto S. Action of aldosterone on renal collecting tubule cells. Curr Opin Nephrol Hypertens. 1995;4(1):31–40. Agarwal SK, Gupta A. Aquaporins: the renal water channels: Indian. J Nephrol. 2008;18(3):95–100. Udelson JE, Bilsker M, Hauptman PJ, et al. A multicenter, randomized, double-blind, placebo-controlled study of tolvaptan monotherapy compared to furosemide and the combination of tolvaptan and furosemide in patients with heart failure and systolic dysfunction. J Card Fail. 2011;17(12):973–981. Rosenberg J, Gustafsson F, Galatius S, Hildebrandt PR. Combination therapy with metolazone and loop diuretics in outpatients with refractory heart failure: an observational study and review of the literature. Cardiovasc Drugs Ther. 2005;19(4):301–306. Jermyn R, Rajper N, Estrada C, Patel S, Weisfelner Bloom M, Wadhwa NK. Triple diuretics and aquaretic strategy for acute decompensated heart failure due to volume overload. Case Rep Cardiol. 2013;750794(10):30. Maestre A, Gil V, Gallego J, Aznar J, Mora A, Martin-Hidalgo A. Diagnostic accuracy of clinical criteria for identifying systolic and diastolic heart failure: cross-sectional study. J Eval Clin Pract. 2009;15(1):55–61. McKee PA, Castelli WP, McNamara PM, Kannel WB. The natural history of congestive heart failure: the Framingham study. N Engl J Med. 1971;285(26):1441–1446. Brouwers FP, de Boer RA, van der Harst P, et al. Incidence and epidemiology of new onset heart failure with preserved vs. reduced ejection fraction in a community-based cohort: 11-year follow-up of PREVEND. Eur Heart J. 2013;34(19):1424–1431. Lala A, Vader J, Dunlay S, et al. A Two-Symptom Congestion Score in relation to outcomes after discharge with acute decompensated heart failure. J Card Failure. 2013;19(8):S39.